It's all eyes on Finance Minister Tito Mboweni who will deliver his maiden mid-term budget speech on Wednesday. The rand closed at R14.43 to the dollar on Tuesday afternoon, averaging a range of R14.31 - R14.44. This as the markets anticipate newly-minted Finance Minister Tito Mboweni's maiden mid-term budget speech on Wednesday. OVERVIEW: U.S. stocks slumped, with the Dow Jones Industrial Average tumbling more than 500 points, after results from Caterpillar and 3M added to concern that corporate profit growth has peaked. The yen, gold and Treasuries all rallied on demand for haven assets. The sell-off in U.S. equities put the S&P 500 Index on track for its 12th loss in 14 days as investors grow concerned that the trade war and rising interest rates have put an end to runaway expansion of corporate profits. Caterpillar sank as much as 10% in early trading after flagging concern over rising materials costs, while 3M dropped more than 8% after cutting its forecast. The Russell 2000 Index turned negative for the year.“Trade tensions here are important, interest rate levels are important, but the next week or two, earnings will be important,” said Matt Maley, equity strategist at Miller Tabak + Co. “The fact that some key multinationals are giving disappointing guidance is a problem." The Dow pared losses after the start of trading, aided by positive earnings results from other index members. Shares of McDonald’s and Verizon rallied after the companies beat estimates. Energy and tech companies were the biggest losers in the S&P. The Stoxx Europe 600 Index slid to the lowest level since December 2016 and Asian equities teetered on the verge of a bear market. Some of the steepest losses were in Japan, Hong Kong and China, where shares had posted the biggest jump in more than two years a day earlier. Disappointing earnings from Renault and some European tech companies added to the pain in Europe. Investor nerves are on full display in the flight to quality beginning to take shape after global equities tried and failed to stem this month’s declines. U.S. growth data later in the week as well as earnings from companies including Amazon, Alphabet, Microsoft and Intel could be key to how far much further the drop will go. In the meantime, uncertainty over the death of a Saudi journalist, Italy’s budget and Brexit are among the factors weighing on sentiment. “Global financial markets continue to struggle to rally as various geopolitical concerns weigh on investor confidence,” Nick Twidale, chief operating officer at Rakuten Securities Australia, said in a note. “With the rest of the world looking much more pessimistic in the current environment,” markets were poised for “a firm correction,” he added. McDonald’s climbed after the company reported global comparable sales that beat estimates, indicating the chain is winning ground in the fierce fight for fast-food market share. The shares rose as much as 4.1% to $173.38, its highest intraday level in almost nine months. The stock had dropped 3.2% this year through Monday’s close, compared with a 3.1% gain in the S&P 500 Index. McDonald’s, which gets nearly two-thirds of revenue from overseas, said comparable sales in its international lead markets division that includes Australia and the U.K. topped estimates, rising 5.4%. The high-growth segment, which includes China, also beat. The company is remodeling restaurants across the globe with a modern look and more tech, such as self-order kiosks. Saudi stocks ended lower for a second day Tuesday, after fluctuating between losses and gains and briefly repeating a pattern in recent sessions of rallies that have triggered speculation state-backed funds are supporting the market. The Tadawul All Share Index closed down 1.3% in Riyadh, with large caps including Al Rajhi Bank, Saudi Basic Industries and Samba Financial Group contributing the most to the drop. The benchmark had earlier risen as much as 0.7%, reversing a loss of as much as much as 1.8%. Prices began recovering as Turkish President Recep Tayyip Erdogan gave a speech in Ankara, in which he said the killing of journalist Jamal Khashoggi in the Saudi consulate in Istanbul was meticulously planned, rejecting Riyadh’s claims that it was an accident. Turkey’s president had vowed earlier to reveal what happened to Khashoggi “in all its nakedness” when he addressed lawmakers. The index flipped back to negative territory about 15 minutes before the end of trading. Erdogan refrained from implicating King Salman, saying he had no doubts about the elderly royal’s sincerity. But he pointedly didn’t mention the power behind the throne, Crown Prince Mohammed bin Salman, who’s been ruthlessly consolidating power at home while crafting an image abroad as a moderniser and reformer. Saudi Arabia on Tuesday announced the signing of more than 25 deals totaling about $50 billion, ranging from energy to metals at its flagship investment forum, even as dozens of top bankers, chief executives and foreign dignitaries canceled plans to attend. Saudi Energy Minister Khalid Al-Falih also said at the event that the country doesn’t rule out boosting oil production. Saudi shares have rallied and slumped amid the fallout from Khashoggi’s murder in the past week, prompting speculation that funds tied to the government could be propping up the securities. The recovery in most of the recent days happened near the end of the session. On Monday, the gauge started reversing a 3.2% drop about 30 minutes before the close, to end the day just 0.2% lower. Erdogan’s speech “failed to bring anything substantial and markets were expecting something different. This pushed the Saudi market markets higher,” said Naeem Aslam, the chief market analyst at Think Markets UK in London. The Turkish lira extended a slump after a key political ally of President Recep Tayyip Erdogan’s AK Party said the partnership won’t hold for local elections scheduled for March. Bonds and stocks fell. The lira slipped more than 3% in the biggest drop in nearly two months. The nationalist MHP will “draw its path by itself only,” the party’s leader Devlet Bahceli said in a speech at parliament in Ankara. In response, Erdogan said that his party wants to continue the alliance and that difference of opinion in various issues should not be allowed to overshadow the ties. The development comes after months of speculation of a rift between the two parties, and raises the prospect of renewed political turbulence in Turkey that could derail a nascent recovery in the nation’s assets. The AK Party needs support from other parties to push through laws in parliament. Bahceli might just be “playing games, pending eventually cutting a deal with the AKP,” said Timothy Ash, an emerging-market strategist at BlueBay Asset Management LLP in London. Among Bahceli’s grievances is Erdogan’s refusal to heed his party’s calls for an amnesty for some prisoners. More than 160,000 inmates will be eligible for the amnesty under a law backed by the MHP, Feti Yildiz, the Deputy Chairman of the nationalist party, said in a televised speech in September. The lira pared its decline and was trading 1.9% lower at 5.7802 against the dollar as of 14:47 in Istanbul. The yield on 10-year government bonds was 79 basis points higher at 19.91% while the benchmark Borsa Istanbul 100 Index fell for a fourth day, led by Turkcell Iletisim Hizmetleri AS. The currency has recouped more than 20% of its value against the dollar from a record low in August, buoyed by tighter central bank policy and signs that Turkey was patching up its broken relations with the U.S. after it released a jailed American pastor earlier in October. Erdogan said Tuesday that the killing of journalist Jamal Khashoggi at Saudi Arabia’s consulate in Istanbul was the result of a thoroughly planned plot, rejecting Riyadh’s explanations of the murder and calling on Saudi’s king to hold all culprits to account. Some analysts see the move as part of Turkey’s bid to regain influence across the Middle East. The central bank sets rates on October 25, and 24 out of 28 economists surveyed by Bloomberg expect that policy makers will hold its one-week repo rate after raising borrowing costs by 625 basis points in September. U.S. futures extended losses, with contracts on the Dow Jones Industrial Average off more than 400 points, after results from Caterpillar and 3M added to concern that global growth is faltering. The yen, gold and Treasuries all rose on demand for haven assets. The sell-off in U.S. equities put the S&P 500 Index on track for its 12th loss in 14 days as investors grow concerned that the trade war and rising interest rates have put an end to runaway expansion of corporate profits. Caterpillar sank 6% in early trading after flagging concern over rising materials costs, while 3M dropped 5% after cutting its forecast. The Stoxx Europe 600 Index slid toward the lowest level since December 2016 as Asian equities teetered on the verge of a bear market. Some of the steepest losses were in Japan, Hong Kong and China, where shares had posted the biggest jump in more than two years a day earlier. Disappointing earnings from Renault and some European tech companies added to the pain in Europe. Gold headed for its highest close in three months and benchmark Treasury yields dropped to 3.16%. Investor nerves are on full display in the flight to quality beginning to take shape after global equities tried and failed to stem this month’s declines. U.S. growth data later in the week as well as earnings from companies including Amazon, Alphabet, Microsoft and Intel could be key to how far much further the drop will go. “Global financial markets continue to struggle to rally as various geopolitical concerns weigh on investor confidence,” Nick Twidale, chief operating officer at Rakuten Securities Australia, said in a note. “With the rest of the world looking much more pessimistic in the current environment,” markets were poised for “a firm correction,” he added. Oil traded at the lowest level in more than a month after Saudi Arabia reiterated its plan to lift oil output and as tumbling equities weakened sentiment. Futures in New York fell as much as 1.8%. Saudi Arabian Energy Minister Khalid Al-Falih said the world’s biggest oil exporter will meet any shortfall in supply as a result of Iranian crude sanctions. Stock markets in Europe and Asia declined alongside U.S. futures as investors flocked to haven assets. Oil has dropped after reaching a four-year high earlier this month as fears over demand persist. Al-Falih’s promise of adequate supply comes even as crude inventories in the U.S. are forecast to have increased for a fifth week, the longest streak since March 2017. Concerns about the health of the world economy, leading to the equities selloff, are seeping into the oil market. West Texas Intermediate for December delivery fell as much as $1.27 to $68.09 a barrel, and traded at $68.32 on the New York Mercantile Exchange at 11:38 London time. The November contract expired on Monday after nudging up less than 0.1%. Total volume traded Tuesday was about 10% above the 100-day average. Brent for December settlement was $1.38 lower at $78.45 a barrel on the London-based ICE Futures Europe exchange. It earlier fell below its 50-day moving average for the first time since August. The global benchmark crude traded at a premium of $10.11 to WTI. Saudi Arabia may boost its oil output by between 1 and 2 million barrels a day in the future, Al-Falih said at a conference in Riyadh. He said earlier this week that OPEC’s largest producer would continue to separate oil and politics. The comments come as the oil market remains on edge following the killing of journalist Jamal Khashoggi in the Saudi consulate in Istanbul. Renault SA reported a bigger drop in third-quarter sales than analysts expected, as turmoil in emerging markets from Turkey to Iran cut into business and currencies faltered in several key countries. The shares fell to the lowest in more than three years after the French carmaker said demand weakened in Turkey, Argentina and India, compounded by a pullout of Iran. Currency declines added to the carnage, including in Brazil and Russia. The company also cut its market outlook for China, where a slowing economy is dragging down car sales and Renault recently upped its presence. The results highlight Renault’s unique dependence on developing countries compared with other major carmakers. The company, based in Boulogne-Billancourt, counts Russia as its biggest market outside of France, and China is now fourth. That’s placed Renault in a tricky position as trade tension between the U.S. and China, as well as President Donald Trump’s activist foreign policy, rattle smaller economies. China Everbright, the state-backed manager of about HK$139 billion ($18 billion) in assets, said the company is preparing to sell shares in as many as 30 stocks on concern that valuations worldwide have peaked. There are 20 to 30 companies in China Everbright’s portfolio that are ripe for exit after they went through initial public offerings, Chief Executive Officer Chen Shuang said in an interview in Hangzhou on Tuesday. Though he didn’t specify which stocks Everbright would sell out of, Chen said the company is planning to make its exits "as soon as possible". "We will be actively disposing of assets and be prudent about new investments," Chen said. "Global markets including the U.S. have peaked. We should be prepared for the next round of financial crises and turmoils." Bloomberg reports that European stocks slumped alongside U.S. futures, tracking a rout in Asia as the global equity selloff resumed. Investors took shelter in safe-haven assets, pushing up prices of the yen, gold and Treasuries. The Stoxx Europe 600 Index slid toward the lowest level since December 2016 as Asian equities teetered on the verge of a bear market. Some of the steepest decreases were in Japan, Hong Kong and China, where shares had had the biggest jump in more than two years on Monday. Gold headed for its highest close in three months and benchmark Treasury yields dropped to 3.15%. Italian bonds fell as the European Union looked set to reject the country’s budget. The State Council announced it would support bond financing by private firms, and said the central bank will provide funding to facilitate this. Elsewhere, oil traded near the lowest in almost five weeks. Emerging-market equities slumped before Turkey was due to announce details of its investigation into the killing of Saudi writer Jamal Khashoggi. The JSE was a sea of red on Tuesday morning, with the All-share index and Top-40 index losing 1.5% and 1.71% to 51 447 and 45 246 points respectively. The Industrial index bled the most, shedding 2.03% to 62 258 points. Financials and Resources were 1.54% (15 274) and 1.01% (40 237) poorer. 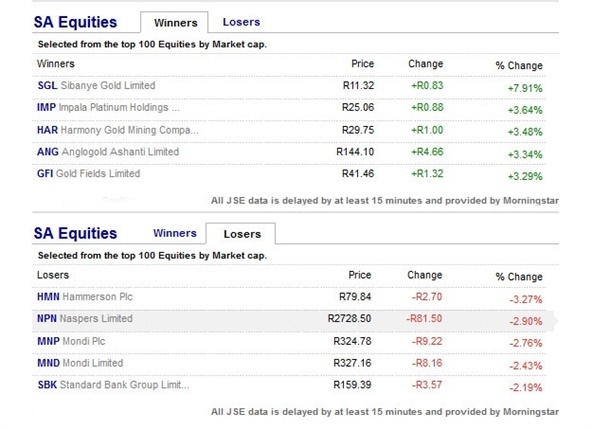 JSE heavyweight Naspers was among the biggest losers, giving up 2.9% to R2 728.50. The e-commerce giant reached an intraday-low of R2 691.09 on profit-taking and a 4.1% slide in Chinese-listed Tencent, in which Naspers has a 32% stake. Gold counters were the big winners, with Sibanye Gold (+7.9%), Harmony Gold (+3.64%), Anglogold (+3.34%) and Gold Fields (+3.29%) putting in a sterling performance. Monday’s stock-market respite was short-lived and the pendulum has swung yet again, Bloomberg reports. On Tuesday, market watchers are seeing slumps of 1%-3% for almost every single major benchmark gauge in Asia. Despite added support from officials, Chinese stocks have returned to their losing ways after a two-day rally of almost 7%. Japan’s Topix index fell 2.6%, and the MSCI Asia Pacific Index is less than a point away from bear-market territory. U.S. stock-index futures have been hitting fresh lows as well. 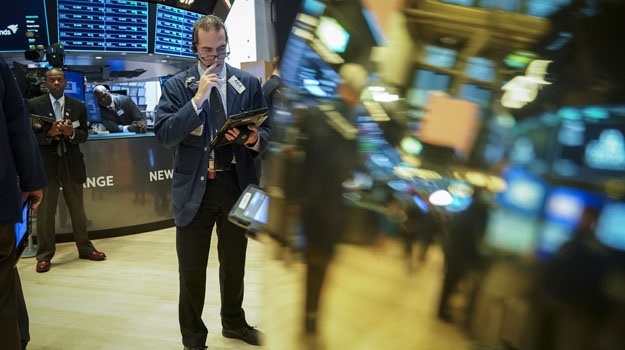 And there’s a plethora of reasons out there: geopolitical tensions, sell-side bulls wavering the U.S. stock market, a possible slowdown in earnings and economic growth are all weighing on investor sentiment. And for reason: globally, analysts have cut profit estimates, with a Citigroup gauge of earnings revisions hitting its lowest level in more than two years. Andre Botha, Senior Dealer at TreasuryONE expects the rand to trade in ranges much the same as yesterday, but "with the local unit starting to follow the EUR/USD the bias is that the rand could test the top side of the range today, looking toward the R14.50 level”. He says the way the local currency has traded gives a distinct impression that the market is uncertain on which way to lean and traders are sitting on their hands until the mini budget speech. "As we suspected yesterday, the rand traded in a narrow range for most of the day. This was hardly surprising as the market holds its collective breath before the Mid-Term Budget Speech and the release of the South African inflation data tomorrow. "It will be interesting to see how the MTBS pans out, with huge two-way risk depending on the tone of the speech." In other news, Botha says the euro is on the back foot with Italy sticking to a budget that breaks the EU rules. "What was pleasing to note yesterday was that the rand stuck in its ranges while the euro retreated against the US dollar, but it looks that the resilience of yesterday has been broken as the rand is currently trading at R14.40 while the euro is still on the retreat." The rand briefly spiked to R14.41 to the US dollar on Tuesday morning, weakening 0.6% against the greenback from its opening level of R14.32. Adam Phillips of Umkhulu Consulting said in a morning note that should the rand nudge up above R14.40/$ there would likely to be some export selling interest. "Back below R14.30 [we're likely to see] some import interest like there was yesterday." 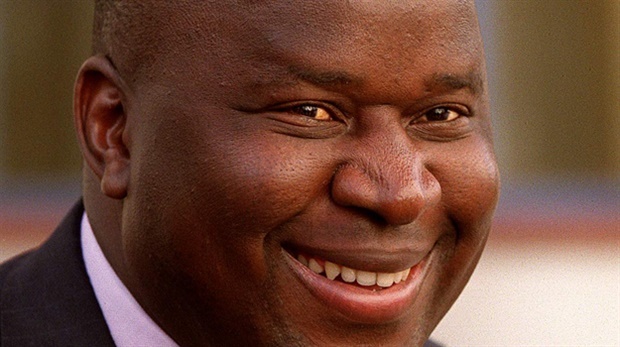 As the temperature in Cape Town soared to 36 degrees Celsius on Tuesday morning, Finance Minister Tito Mboweni may be feeling heat of a different kind, reports Bloomberg. Mboweni, barely two weeks into the job, has to reassure investors and rating companies in his mid-term budget speech in the city on Wednesday that he has the budget deficit under control, while finding money to boost an economy that fell into recession in the first half. Investors seem confident he can: bond yields fell to two-week lows on Monday and the rand gained, while traders curbed bearish bets on the currency. Analysts from Nedbank Group, Citigroup and Informa Global Markets are predicting a rally in the rand, even as the projected budget shortfall is seen wider than the February estimate of 3.6%. As long as the gap remains below 4%, sentiment won’t sour toward the rand, according to Mehul Daya and Neels Heyneke at Johannesburg-based Nedbank. Expected range for rand: R14.25/$ - R14.45/$. The rand traded in a tight range throughout Monday, despite a stronger dollar. 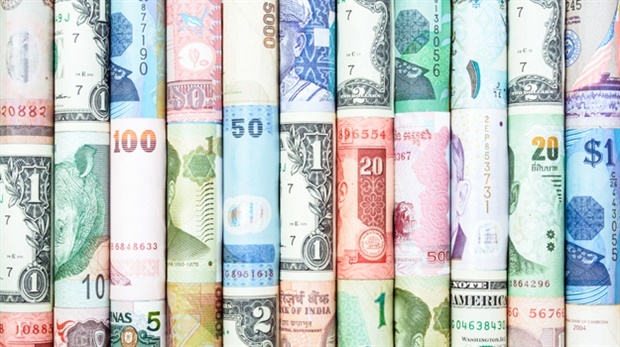 International markets were steady with little market-moving data being published. The markets are now eagerly awaiting the Medium-Term Budget Policy Statement on Wednesday to provide some clarity on the direction of the local economy and hence the rand, comments Paul Muller, Corporate Treasury Manager at Peregrine Treasury Solutions. The only data of significance to be released today will be the EU consumer confidence indicator. Asian markets mostly fell on Tuesday as geopolitical risks pile up, from US tensions with Russia and Saudi Arabia, to trade issues and Italy's budget stand-off with the European Union, reports AFP. Shanghai and Hong Kong saw deep losses, having soared over the previous two trading days after China's top brass issued coordinated statements of support for the country's markets and officials unveiled tax cut plans. The gains had provided some much-needed support to Asia but investors reverted to selling on Tuesday, with nerves tested further after Donald Trump's warning that he will pull out of a nuclear treaty with Russia and bolster America's arsenal. What are we waking up to? Dollar firmer against most currencies this morning with the Chinese yuan falling to 6.9500. The pound fell to 1.2950 as Theresa May’s political future put the currency under pressure. Political unease over the Italian budget also caused the euro to fall to 1.1450. The rand has slipped slightly against the $ this morning but is holding the firmer levels against both the pound and euro. Asian equity markets have followed US markets lower with the US futures opening lower again this morning. Good morning, welcome to Fin24's Markets LIVE blog. The rand opened steady at R14.32 to the US dollar, Asian markets have resumed their downward spiral as geopolitical fears set in, and Wall Street ended mixed in a volatile day of trade.